Ship Rock, Chaco Canyon, Monument Valley, Mexican Hat. To devotees of Tony Hillerman these names conjure up the mystery and magic that flow through his novels of the southwest desert and its people. 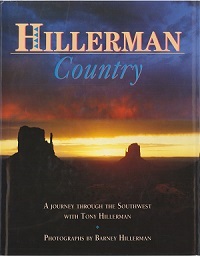 With Tony's words and over 200 spectacular color pictures by his brother Barney, Hillerman Country takes the reader to all those places and dozens of other towns and mountains, mesas and washes that are such an essential part of Tony's award-winning novels.